LOCATION. LOCATION. LOCATION. The well-known expression has become a well-known fact in the real estate community especially in Sea Pines Plantation on Hilton Head Island. "To be in existence, be successful and be as popular of a world-class resort for 50 years like Sea Pines has means you have to be doing something right," says Bruce Tuttle of RBC Enterprises, Inc. The high profile that has come along with hosting professional golf and tennis events over the years, most of which have been on national TV, has obviously benefited the popularity of Sea Pines. The unique development of Hilton Head Island, with its strict adherence to quality controls and land conservation, can be traced to the fact that Sea Pines was started here. 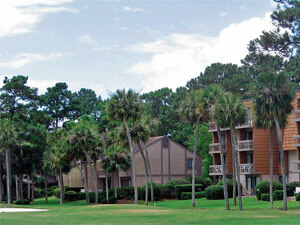 And the Plantation Club Villas boast one of the best locations in Sea Pines. Situated in the midst of the resort's natural surroundings, the bike paths meander through and about the area, providing short scenic passages to popular tourist attractions such as Harbour Town, Sea Pines Center and South Beach. Outdoor opportunities abound with marina activities, nearby pools, tennis courts, the Sea Pines Beach Club, world-renowned golf courses and fishing holes. And you don't have to pay a king's ransom to live like one. According to Tuttle, The Plantation Club Villas are at a very moderate price point in comparison to other villa properties in Sea Pines, especially considering the location. Which is not to say that property values at the Plantation Club Villas do not continue to steadily soar. Prices have risen from $80,000 for a two-bedroom and $140,000 for a three-bedroom in the late 1980s to $500,000- plus for a two-bedroom and $625,000-plus for a three-bedroom now, Tuttle explains. Getting in while the getting is good means not only a smart investment for the villa owner but also an opportunity to get acquainted with the Island. Plantation Club Villas are a perfect stepping stone real estate investment for the individual who wants to invest in real estate, wants usage out of that real estate but wants a property that is highly desirable for rental income. This also gives the property owner a chance to get to know Hilton Head Island better and a way to decide if this is where they want to retire by owning a rental income property like this for five years, then maybe stepping up to a home or other more permanent residence, says Tuttle, speaking from personal experience. A native of Adrian, Michigan, Tuttle first arrived on Hilton Head Island in 1968 after his grandmother purchased a home in Sea Pines Plantation. A frequent visitor for vacations through the 1970s, he made the move permanent in 1979. After 27 years, Tuttle is a true testament to another well-known expression: "Home is where the heart is."